Enterprise-level business intelligence (BI) and financial reporting gets boost from eXtensible Business Reporting Language. If you handle enterprise-level business intelligence (BI) and financial reporting, it won't be long before the front office summons you to deal with eXtensible Business Reporting Language (XBRL). XBRL is an XML vocabulary for exchanging business and financial data. It's a standard for machine-to-machine reporting that's been adopted by the U.S. Securities and Exchange Commission (SEC) and European authorities. Altova, well known for its leadership in all things XML, has updated its products to support XBRL and bundled them into MissionKit 2009 for Enterprise Software Architects. The goal is to give you the tools (but not necessarily the training) to deliver reports compliant with the International Financial Reporting Standards (IFRS). For XBRL beginners, it would have been ideal to have a hands-on walkthrough that starts with a financial database and ends with a valid XBRL document ready for submission to authorities. Alas, there's no "XBRL For Dummies" manual included. While each application includes tantalizing tidbits on working with XBRL, I felt like I was solving a jigsaw puzzle without seeing the entire picture first. XBRL is the "buzz" in Altova's all-in-one suite, but don't overlook the features that have long made the individual components the premier development environment in the XML space. It's hard to beat XML Spy as an all-round markup editor, validator and XPath query designer. Its Grid view is especially useful for collapsing and exploring very large documents. As you work, the Messages pane reports errors, explains the problem and highlights the location. The other day, I fed XML Spy an XML file containing Expression Encoder ScriptCommands. XML Spy generated a schema for it in an instant. Be careful what you ask for when converting an entire database into XML, though. I ended up with 234 files while searching in vain for XML Spy's cancel button. Altova MissionKit Boasts XBRL Savvy: Produce Readable Financial Documents Using XSLT Stylesheets. StyleVision, a member of Altova's MissionKit 2009 suite, lets you design human-readable documents from machine-to-machine files in XBRL format. 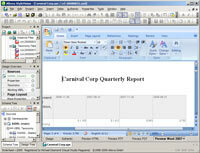 The output options include HTML, RTF, PDF and Word 2007. MapForce is Altova's flexible tool for mapping and filtering data graphically from one source to another. 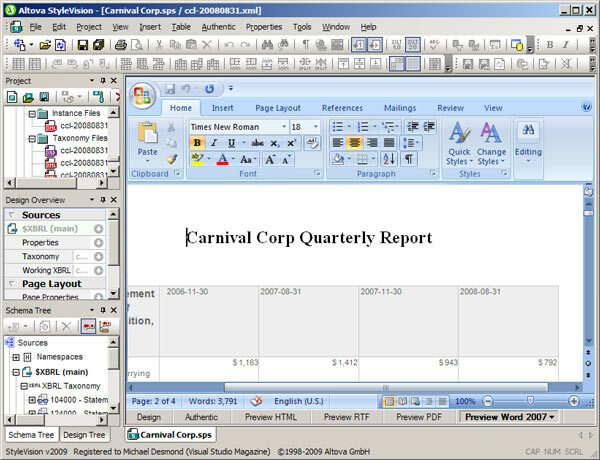 The source or target can be a database, .EDI document, Web service, Excel 2007 spreadsheet or a lowly .CSV file. MapForce will generate the C# classes you might need to automate data conversions. The third major component, StyleVision, lets you design XLST templates into which you pour data for human consumption. If you're getting into XBRL, be sure to explore the quarterly report sample and the Word 2007 preview to see the richness of its output. One issue I encountered with MissionKit 2009 was previewing a stylesheet as a PDF. Even though I had chosen a full installation, StyleVision strangely prompted me for a 19MB download of the Apache (Java) Formatting Objects processor. Even with that in place, the PDF document still failed to appear. I would expect Altova's setup kit to automatically install the rendering engine and tell its PDF module where to find it. Quick Facts: Integrated bundle of XML, database, XSLT designer, validation, and publishing tools with added emphasis on financial reporting support. Pros: Handles all popular and emerging XML-based technologies including the XBRL-compliance standard; extensive online documentation and Web-based support; many examples. Cons: Needs end-to-end walkthrough on producing XBRL reports; rendering engine for previewing PDF documents not fully installed.